A very important game for three side to be in playoff’s on a double header day. 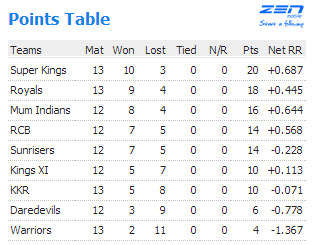 Game 1, KXIP took on Royals, both needing a win, especially KXIP. Dravid won the coin and decided to field first as he always wanted to be. KXIP lost Mandeep Singh in the very first over, which meant Skipper Gilly who is back in the side has to put down his natural game and has to consolidate with his country man Marsh. That’s what happened as both put on a century stand but in 13 overs, not very much likely for a destructive pair. None other than these were worth mentioning as KXIP ended less than par score of 145/6 in 20 overs. Cooper picked a 3/23 in 4 overs. Dravid went early with just 5 runs on the board, But Rahane & Watson continued their good form to build a platform of 66 runs between which allowed Sanju samson along with Rahane to finish the match with an over to spare. This win also means Royals are almost into playoff, provided some one doesn’t play a bluff. Game 2, KKR needed a win just to keep their mathematical hope alive as KXIP lost the previous match. Skipper Gambhir finally played a more sensible innings along with Ten Doeschate to keep KKR scoreboard moving Late strike from Bhatia & Tiwary made sure KKR crossed 150, as they ended 152/6 in 20 overs.As usual Pune continued to display a poor & pathetic performance with bat. Uthappa & Mathews scored couple of 30’s apart from that nothing to highlight in the Pune’s batting card. – 40 runs scored by Matthews is the highest for this season. – Bisla stumped by Rawat off Bhuvaneshwar Kumar is the first stumping for Bhuvaneshwar in his career, overall in this season it is sixth for a seam bowler. – Pune has never won a game against KKR, stat is 4-0 including today. – Rajasthan royals won their 7th game in straight while chasing. – Rahane scored 4th IPL fifty of this season and 10th overall in his IPL career. – Chawla has picked Watson thrice including today, highest by any bowler in IPL. – 102 runs between Gilly & Marsh is the third century partnership for this season for KXIP and it is also the slowest of all three. – PWI have lost their 11th game for this season. 1. Royal Challengers Bangalore 2. Chennai Super Kings, 3. Mumbai Indians and 4.Kolkata Knight Riders. 1. Delhi Daredevils, 2, Pune Warriors, 3. Rajasthan Royals, 4. 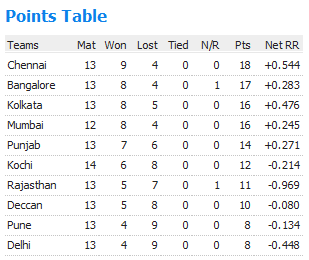 Kochi Tuskers Kerala and 5. Deccan Chargers. – Gambhir scored his second fifty of this season and 10th overall in IPL. – Today’s match had just 3 sixes being hit, one each by Ganguly, Tiwary and Yusuf Pathan. – This is 6th time in this season a team have won by 7 wickets margin. – Gambhir went out opener for the first time in this season. – KKR won their 4th game chasing for this season, which also means they have won 4 batting first, rather to say, they have been asked to bat first, because whenever Gambhir wins the toss he will field first.